More than 600 instruments have been collected for the Play for Cuba appeal. They include 180 guitars, three double basses, around 80 violins, violas and cellos, drums and brass and wind instruments. An amazing baby grand piano - worth thousands of pounds - has been donated and is destined for one of Cuba’s conservatoires. Over 3,000 pairs of ballet shoes from the Royal Ballet were also packed on to the shipment which includes arts and sports materials. Due to the success of the appeal, TWO full shipping containers will be sent to the island. All are welcome to come to wave off the instruments at a public event from 6pm on 14 April 2019 outside the ACC in Liverpool. There will be music, speeches and a 40ft container outside the National Education Union’s (NEU) conference, which was a main sponsor and supporter of the appeal. 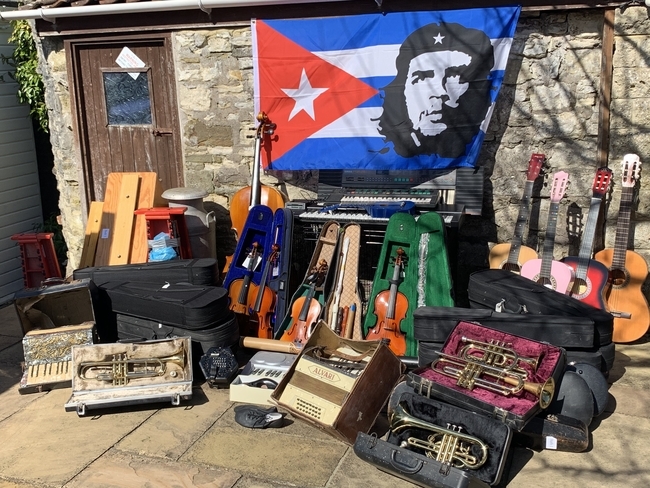 From every corner of England, Scotland and Wales, Play for Cuba supporters have been busy collecting instruments and promoting events to ensure the success of this wonderful project to help students across Cuba. North London supporters decided back in autumn 2018 that putting on a benefit concert would be a fine way to raise money for the Play for Cuba Appeal which, apart from instruments, needed funding for the cost of the container and transportation. “Over a few months we prepared and promoted the event and when the night came round it lived up to all expectations. We opened with the sweet tones of Ahmed Dickinson’s classical-style guitar; next, in a complete change of mood the Near Jazz Experience (NJE) belted out a great set which had us all dancing. Wonderful Cuban jazz virtuoso Omar Puente soloed for twenty minutes in his inimitable style on electric violin and then, as a finale, Omar played with the NJE,” reports Lorraine Tillet from North London CSC. Kevin Courtney, Joint General Secretary of the NEU, spoke about why there was a need for the instruments and how impressed all the NEU delegates to Cuba have been with the education system which values cultural education equally to other areas. It was a memorable evening music-wise but also a huge success, both in terms of spreading the word about the appeal and in raising over £1,000 towards the costs. Thanks to all involved, especially the musicians who gave us their time and talent for free. Manchester supporters held a fantastic event on 17 February for the Play for Cuba appeal at El Cuba Libre restaurant in Hyde. They raised over £300 for the appeal, and this was matched by the restaurant who gave them another £300 from a previous event! Speakers included Carole Regan (CSC), Julie Lamin (NEU), Paula Barker (UNISON North West Convenor) and Leigh Drennan (Labour Party). Merseyside CSC reported that what began as a discussion last August with International Solidarity Officer for Wirral NEU, Neil Sledge, rose to a triumphal evening of music, song, dance, and poetry and a sell-out celebration at Liverpool’s the Casa on 20 March. Tony Green, The Spangles, Mexico 70 and the Luminelles provided superb value for money for the £5 tickets which together with donations and a raffle raised £580. Thanks to Wirral NEU for funding the room hire and Liverpool PCS for printed materials. Liverpool CSC hopes to contribute an almost full orchestra of over 100 instruments, from harmonicas to cellos.